Register for the Saint Lucie Skeeter Skoot today! 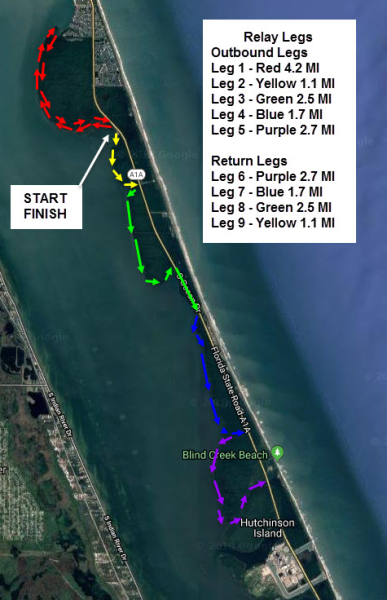 Additional race information can be found at http://www.skeeterskoot.com. Relay Team members can run one or more legs, in any order, as long as each team member runs at least one leg. Relay teams are responsible for transporting relay runners to exchange points - there is adequate parking at each exchange point. 50K consists of running from Start/Finish north out and back 4.2 miles, then south out 8 miles and back 8 miles, then running the 4.2 mile north out-and-back again, and finally running south to a turnaround point about 3.6 miles south of the Start/Finish, for a 7.2-mile final section. Total mileage should be approximately 31.6 miles. 100K will run this course twice to reach a total of 63+ miles.